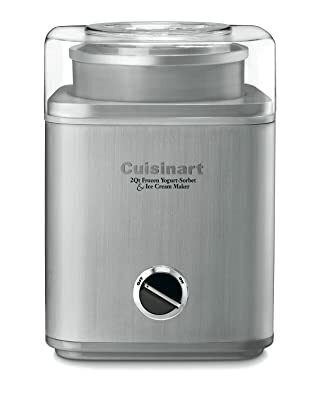 This may sound like a no brainer; but the obvious key to churn out homemade ice cream, gelato, sorbet and many other frozen desserts has to be a good reliable ice cream maker. But buying the best ice cream maker requires some research. To make this review as comprehensive and detailed as I possibly could, beside doing my own testings AND eating (Cookie dough, double fudge brownie, mint chocolate chip, plain old vanilla…. Yes, I did enjoy myself, and yes I did gain a few pounds! ), I read consumer reviews and reports on sites like Amazon.com, ConsumerSearch, GoodHouseKeeping, AmericasTestKitchen, Cooking.com and a few others. I also looked at all kinds of treat makers, from modern electric to old fashioned wooden hand crank, from soft serve to hard serve and everything in between. In the end I decided to focus on models that are among the star performers at their individual price points, as some of these models aren’t worth a second view, let alone close scrutiny. And that brought me to my top 8, out of which, I have chosen one as the absolute best one considering price, quality, ease of use, etc. But before we get to the list of top 10, for those of you who are not familiar, let me explain the different kinds of ice cream makers. I looked at a lot of different machines (If you read my About page, you will know why). I have published my take on 10 of the most well-known ones here on this site (in no particular order). 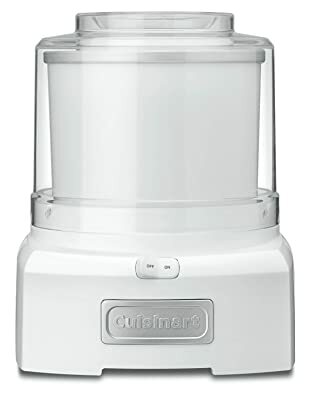 But if I had to narrow it down even further, I would pick the first 3 mentioned below as the winners, giving the “Best Ice Cream Maker” title to Cuisinart Ice-30BC. 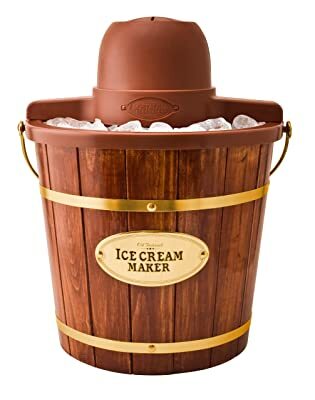 Of course, the decision on which machine to buy rests on your lonely shoulders, but if I were in the market for an ice cream maker, I would go with one of these. This electric Cuisinart model is much heralded among professional testers and owners. The draes are its simplicity, durability and fun factor. The pre-requisite of pre-freezing does not bother them one bit, as owners claim that the quick and tasty results from this compact and durable 2-quart machine more than compensate for the extra preparations. This does not score high on the “look” department, but it certainly is right up there with other pricier models where quality of the produced frozen treats is concerned. Due to its simple structure, it is easy to assemble, operate and clean. The machine comes with a helpful instruction manual and a limited one-year warranty. 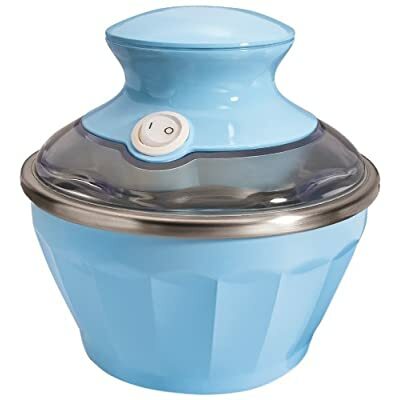 It is said that there are no unhappy owners of the Nostalgia ICMW400 Old Fashioned Ice Cream Maker. In 20-40 minutes, it is capable of producing a gallon of tasty and creamy ice cream. The powerful motor holds up really well even with heavy usage. In addition, it is easy to assemble, operate and clean. This electric Frozen Yogurt, Ice Cream & Sorbet Maker is not the best looking one out there, but my own experience shows it does the job. 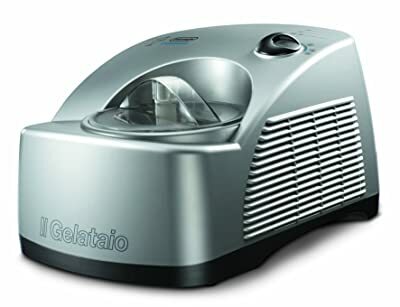 One of the most expensive machines is the DeLonghi GM6000 Gelato Maker. You may like this if you like the idea of enjoying Italian-style gelato at home whenever you want. But there are some drawbacks as well. 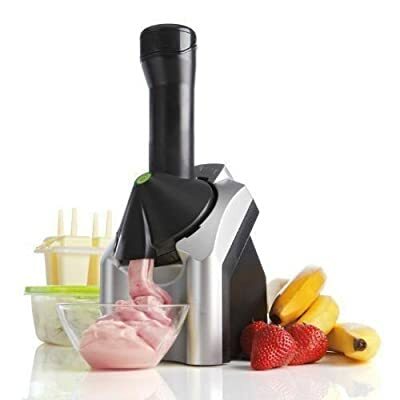 This machine is perfect for those who like to make frozen desserts using just one or more ingredients. With a price tag of just under $200, it can be a great addition to your kitchen applinces. Not to mention it is small and so it won’t take much room in your kitchen. Some reviews I read claimed this thing produces desserts better than what you can get from Italian gelaterias, but although my tests revealed something more. It is the most expensive one I have bought and reviewed, but for the long haul, it is worth it if you have the cash. If you are looking for an ice cream machine that can make enough for just a few people, this is your best bet. Of course it has its own drawbacks, one of them being. To guide you on your decision, you have to first look at how your ice cream maker is made and stored. Manufacturers have introduced a wide variety of ways to make and store ice cream. Quantity produced with each batch. And whether or not it is frozen automatically. Essentially all ice cream makers can be categorized into 3 groups, vary by the 3 different methods of churning out your ice cream mixture. Depending on how much you are willing to spend, your usage frequency and how organized you are, you can make a choice among these three. Packed around the bucket or bowl of the ice cream maker to help maintain the temperature below freezing point. Pros: Most prevalent among hand-crank models, the highly portable and solidly reliable version. Regardless of hand-crank or electric model, the ice cream makers that utilize ice and rock salt are known to produce large, ice-cream-party-size batches of 4, 5, or 6 quarts of ice cream. Cons: In the summer, you may have problem finding enough rock salt (but table salt makes a competent replacement). Still, this can be messy and inconvenient, and users need to monitor salt and ice levels regularly; which adds another step to your ice cream making experience. This is the more popular option. These metal bowls, or canisters, hold a special liquid freezing solution between insulated walls. Important note is that you must pre-freeze the bowl a few hours before you get started with the ice cream making work. It is capable of maintaining the freezing temperature even as the mixture is churning. Most models offer capacity of around 1 1/2 quart. Pros: If you follow instruction well, they are fairly efficient and they are priced reasonably. Cons: You need to spare precious freezer space for the bowls. Due to the requirement of pre-freezing (lasts anywhere from 6 – 24 hours) on the dedicated bowls, you are stuck to just making one batch at a time, unless of course you invest in extra freezer bowl. These are higher end models with their own freezer system; get your ingredients into the bowl and turn it on, the least troublesome version. Pros: It is by far the easiest and most convenient to use. No freezer bowls, no ice, no salt, no cranking. It allows you to make consecutive batches, anytime. The built in freezer can prepare the ice cream base to a normal ice cream consistency, a strong advantage over makers without freezer, which serve only the soft-serve variety. And they do have a solid feel about them, unlike those lightweight flimsy competitions. Cons: Naturally they cost a lot more; you obviously have to pay for that extra convenience. And they are really heavy. You should by now have a fairly good idea of the various sorts of ice cream makers. This serves as a good starting point. You next job is to find out what are some of the considerations when buying an ice cream maker so that you can match them to your specific needs. Unless you operate on bottomless budget, this factor is probably the most important one to guide you on your purchase. The price tag can go anywhere from $40 to $250. Of course the assumption is that the costlier versions tend to equate to more reliable and possibly more durable machine, so you make more ice cream over time. That assumption aside, there is no guarantee that high cost means better ice cream. Capacity wise, there is quite a wide range across ice cream makers; from 2-quart output to 6-quart output. But the capacity is only important to you once you are clear on the amount of ice cream you want in one batch. Say your household is a fairly big one, obviously a bigger machine would serve better. Another fact to bear in mind: as output grows, the time to make ice cream gets longer. If you are ready to pay more on an ice cream maker, make sure that you get durability in return. The motors inside are on serious continuous strain as the machines churn cream until it becomes thick and frozen. If you already have some machines in mind, compare the warranty situations across makers. Conduct research and read reviews before you commit to any purchase. Internet is one excellent place for you to do this. You can check out Good House Keeping and Consumer Reports, two among the many sites that are dedicated to the appraisals of household appliance. If it turns out that the machine you are eyeing is associated with tons of negative reviews (especially on durability or output), you better start looking at another model. While you are on internet checking reviews, make an effort to pay attention to on people’s comment on how easy for the machine to be cleaned. Some machines can be taken apart easily so users can thoroughly clean it inside out. If your preferred machine does not conform to this, high chance that you will experience a laborious and messy cleaning process. I would suggest you start looking else where. As you draw up a short list on what could become your potential ice cream makers, it is time to start shop around and compile pricing information. I would suggest you go online as there are many sites that allow you to do quick comparison across many different makes and models. My personal favorite is Amazon.com. It is by far the easiest and quickest way to compare features and specifications across different machines and let you sniff out the best bargain online. 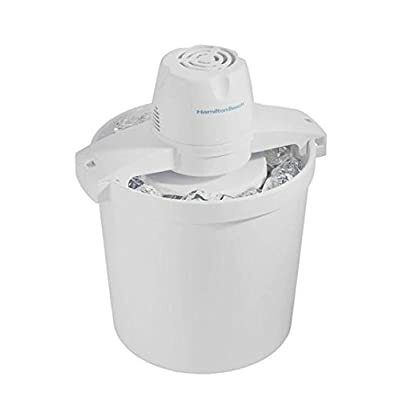 The benefit of shopping on Amazon (or online in general) is not just restricted to quickly identifying your favored ice cream maker, but also offers the opportunity to read feedbacks from customers. Such inputs are really valuable as they can serve to guide your buying decision. You no longer just check out features and specifications, but real life experience of owners with their respective machines, both positive and negative. Just to sum up above, get started by deciding a budget that you are happy with. Look around for the types of ice cream makers that would appeal to you. 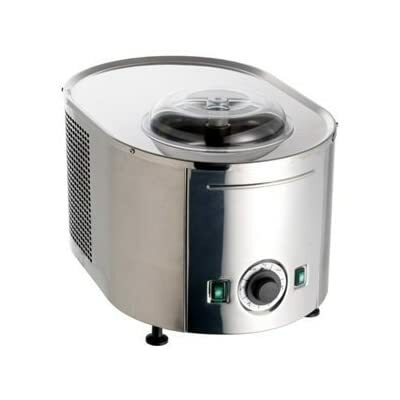 Go with specific ice cream makers that are within your budget and draw up comparisons on individual features. As you get to your short list, check out what customers have to say about their machines. Hopefully the whole cycle would help you arrive to the most optimum decision. Recipes: 15 Delicious home made ice cream recipes from Delish.com that kids and adults will love. Tips: Learn a few tips and tricks from About.com to help you make the best tasting frozen desserts. Safety: A few tips from FDA.gov on how to enjoy home made ice cream without the risk of salmonella infection. History: Learn a few cool facts about this popular food and its origins (from folks over at Dakota State University). Nothing taste sweeter and more delicious than ice cream whipped up in your own kitchen. I personally think the process of making treats such as frozen yogurt, sorbet, sherbet and, of course, ice cream, is just as satisfying as eating them. Which is why I think every household should have a good ice cream maker. It is true that you need to invest a little to make great ice cream. But I think, just like most things in life, that little extra premium you fork out would yield that extra gratification in the end. Two things come to mind with homemade ice cream; first is easier to make and possibly much tastier than what you get from a store. Plus, in the long run, you will save a lot of money by not having to buy them from the grocery store. The better ones that are going to last would cost you additional money, no doubt! I guess you are sharing that same sentiment since you have made it to this point of my review. Regardless, you need to get started with a good quality ice cream maker, which I hope my reviews will help you do just that.